We're still a few months away from the start of Girl Scout Cookie season, but next year's line-up welcomes a brand new cookie to the annual, limited-time options – and the group's third-gluten-free option. The hundreds of thousands of Girl Scouts selling cookies next year will offer the Caramel Chocolate Chip cookie, the organization announced Tuesday. The chewy cookie is made with caramel, semisweet chocolate chips, and a dash of sea salt. 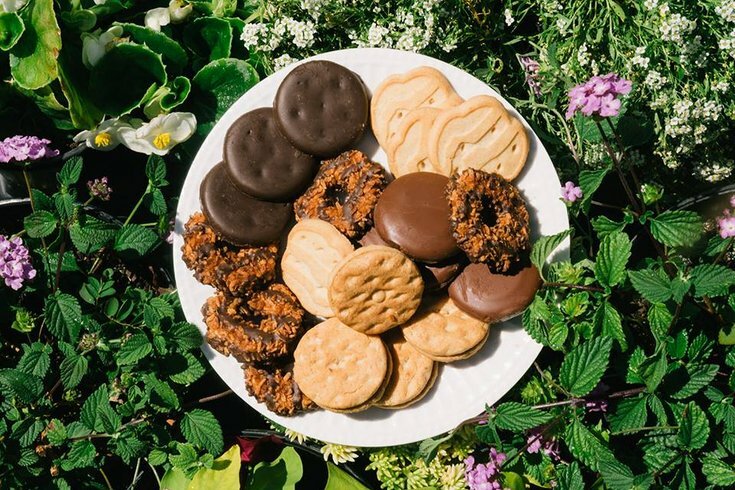 Though the snack is a fresh addition for the long-running Girl Scout Cookie Program, it is not the organization's first gluten-free add. The Toffee-tastic – butter cookies made with toffee chunks – and the Trios – a peanut butter oatmeal cookie with chocolate chips – have been gluten-free options for a few years now. You can check out the full cookie menu, plus nutritional info, here. The last time new cookies joined the Girl Scout selection was in 2016, when two new S'mores varieties were introduced. Though the Girl Scouts of America got its start in Georgia, we have Philly to thank for introducing the entire cookie-selling aspect to the organization. After years of different chapters baking cookies for their communities, some entrepreneurial Philly scouts, in 1933, started selling them in some of the city's gas and electric company windows. In 1934, the Philadelphia chapter became the first chapter to sell commercially baked cookies. By 1935, New York caught on, and by 1936, the organization started licensing the first commercial bakers to produce cookies that would eventually be sold nationwide. Check out the full history of Girl Scout cookies (and get excited for the 2019 season) here.